The program works on PC-compatible machines with Microsoft Windows operating system. The updated ram.bin and register.bin files are saved when the program is terminated. If they weren't found, they will be created. In such case the memory has to be initialised with the F8 button. On entry, the starting address matches the Program Counter, but it can be modified by clicking on the address in the first line. New value must be confirmed with Enter. The HEX box allows viewing/changing the RAM contents only. It is possible to modify the starting address and the RAM contents by clicking on them. Enter accepts the changes. The contents of the registers can be modified by clicking on them. Enter accepts the changes. The top area in the register box show the state of the upper six bits of the Flag register. They can be modified as well. Closing the debugger windows resumes the program execution without tracing. Pressing the button [Run] in the Single step group box executes a single machine code instruction. 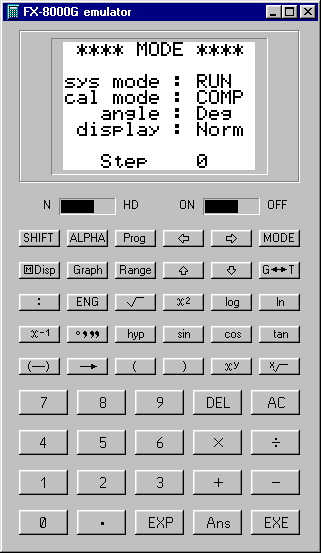 To execute a specified number of machine code instructions type the required value to the field in the Number of steps group box, then press the associated [Run] button. The Breakpoint group box allows to specify condition that determine when the program execution should be interrupted. Currently it only compares the Breakpoint Address typed in the field with the Program Counter. When they match, the program execution is stopped and the debugger window reappears. 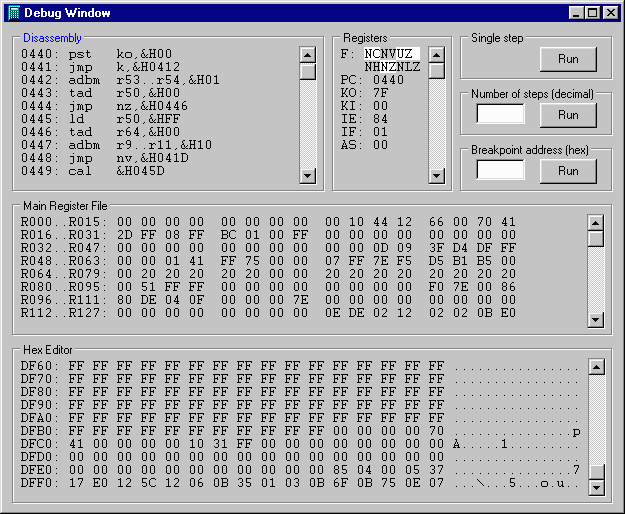 Some parameters of the emulator can be customised by editing the fx8000g.ini file with any text editor. This setting specifies the emulated CPU clock frequency in kHz. The value specifies the time in ca. 30-60ms units the TEST pads on the PCB are connected after starting the application. Value of 0 should be used for normal operation. Value of 20 is recommended for performing the self-test diagnostic routine. To uninstall the emulator, simply delete the directory where it was installed. The program doesn't modify anything outside its installation directory. The program includes a freeware component ThreadedTimer developed by Carlos Barbosa. The ROM image rom0.bin had to be patched (swapped instructions at the locations &H02C6 and &H02C7) due to some unsupported property of the keyboard port. The scrolling function of the LCD controller command $8 isn't supported. Bugs may still lurk in the rom0.bin memory image.